Lucy Turner, 32, sent shop worker Danielle Wood sprawling over the bonnet as she drove into shoppers outside Tesco in Rickmansworth on 23 December. They tried to block the car with their trolleys as Turner attempted to drive off with stolen alcohol. She was jailed for three years and two months for offences including causing serious injury by dangerous driving. Turner, from Borehamwood, also pleaded guilty to two charges of theft, attempted theft, using a vehicle without insurance, driving while disqualified, failing to stop and failing to report a collision. 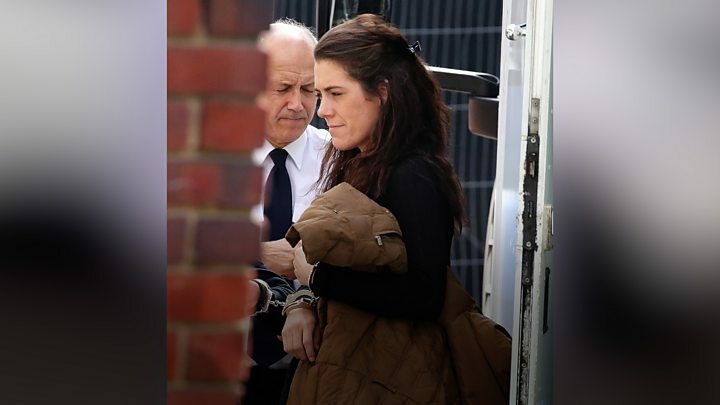 St Albans Crown Court heard Turner was the getaway driver as her accomplices - a man and woman - stole £174 worth of alcohol. After failing to get out of the fire exit, they were intercepted by staff at the front door, with the store manager trying to block the car with trolleys, prosecutor Richard Jones said. A social media video of shoppers being driven at was shared hundreds of times. After hitting Ms Wood at an estimated 35mph, Turner swapped places in the car with the man, who barged out of the car park and fled. He remains on the run, the court was told. Ms Wood, 26, said she was "petrified" as the car drove at her at between 35mph and 40mph. "I was in agony. I knew I had broken my back. I was screaming 'My back, my back!'" she said. She was treated in hospital over Christmas for a fractured vertebra but, three months on, is still wearing a brace and has postponed planning her wedding. Ms Wood added: "I fear I will always have pain. It hurts emotionally and physically." Chantelle Stocks, defending, said Turner had developed a drug addiction after the death of her son in 2008. Turner was also banned from driving for four-and-a-half years.